Interests - Racing cars (Disney 'cars' and Roary the Racing Car) and any kind of Digger. Star Wars, Battle Strikers, Hot Wheels. 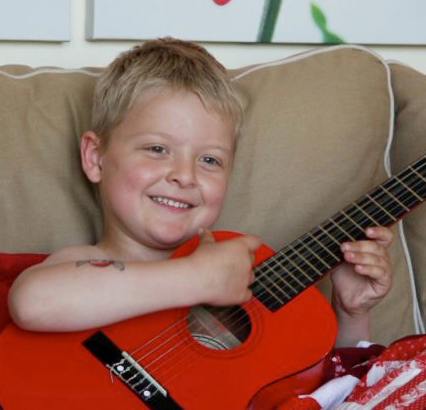 Jack was diagnosed with Acute Lymphoblastic Leukemia (ALL) on 6th July 2007. The diagnosis was a complete shock. Jack had been off colour for a few days and had a few bruises on his legs which we thought were caused by him play fighting with his big brother Marcus who is 9. Luckily our GP sent Jack for a blood test and within 10 hours and a very exciting trip in an ambulance with sirens blasting we were admitted to Addenbrookes hospital in Cambridge where Jack began chemotherapy. Jack was initially in hospital for 3 weeks and reached remission during this time, but he now had to face 3 years of treatment. Unfortunately in November 2007 Jack became very ill when an infection in his hickman line spread to his heart and he had to go into intensive care. The hickman line was removed and after 6 weeks of IV antibiotics we received the fantastic news (just before Christmas) that the infection in his heart had gone. Jack is a fantastic, beautiful, happy little boy who fills our life with joy and who we could not love any more if we tried. I think it is time for Jack to move on. I think that with only a week left of treatment the time is right. I can not express deeply enough what all the cards, letters, emails and gifts have meant to Jack (and his brother Marcus). We have two boxes full of cards and letters that I will keep forever as they are a big part of Jack’s Journey. Huge thanks to everyone involved with Post Pals – never doubt for one minute that you make a huge difference to a poorly child and their families – we have had some really dark days during the last three years but the kind words and support we have received have helped tremendously. Please never ever stop sending post to Pals – we shall now be sending post rather than receive it and will know how exciting it is when a brown parcel arrives and you have no idea what is in it! As always, I must apologise for not updating Jack’s page recently. Time has really flown by. Jack continues to do well – he has only had two short stays in hospital in the last three months. After his last Lumber Puncture at the end of May, he had a leak of spinal fluid which caused him to have a severe headache and vomiting – he has had over 20 Lumber Punctures in the last three years and this is the first time this has happened. He also had a nasty kidney infection and was passing blood in July – so he had to go into hospital for five days of Intravenous antibiotics. Jack is continuing with physio for his hips as he is suffering from the long terms effects of chemo and steroids – he is now having weekly sessions with the Physio in the pool – which he enjoys. We are now counting down the days to the end of treatment – Jack has his last Vinchristine at Addenbrookes on Thursday 5th August and his last Lumber Puncture on Thursday 26th August – it does not seem possible we are nearing the end of this journey. Looking to the future, we are hoping that Jack will start to return to school on a more regular basis as his immune system picks up. As always, thanks to everyone who has taken the time to write to Jack and send him gifts, letters and cards. I’m so sorry I have not sent an update for a couple of months. Jack is doing well and even managed to go into school a couple of times – he is now in his last five months of treatment – we have been given the date of 30th August 2010 for his last Lumber Puncture and Chemotherapy. Health wise he has been pretty good, only one stay in hospital due to another outbreak of shingles – which is very painful. He has also been referred for Physio as he has been experiencing a lot of pain and muscle weakness in his legs – a side effect of almost 3 years of daily chemotherapy and long term steroid usage. Now the weather is so much better we are encouraging him to walk more and ride his bike to strengthen his muscles. The walking is important as we have a new addition to our household – a Chocolate Labrador Puppy called Lola – we got her at 8 weeks and she is now 18 weeks and is a total nutcase!! It has been so sad to read about the loss of so many Pals in the last few weeks and despite everything we have been through with Jack it makes us realise how lucky we are that the survival rate for children like Jack diagnosed with Acute Lymphoblastic Leukaemia is now 95%. We try to do as much Fund Raising as we can for Leukaemia & Lymphoma Research and joined Sir Ian ‘Beefy’ Botham for his charity walk last week in Milton Keynes & Hyde Park, London. We had a wonderful time – meeting up with old friends and making new ones, Marcus was chuffed as he met Freddie Flintoff and had a cricket bat signed and had his photo taken – Sir Ian was great as usual – even though Jack was on steroids and very very grumpy!! We have received loads of emails in the last few days which I will try and reply to and as always would like to say a huge THANKYOU to everyone who supports Post Pals and takes the time to write and send gifts to the children and their brothers and sisters and for the kind words of support that they send us parents. Happy New Year to everyone – hope you all had a wonderful Christmas. THANKYOU THANKYOU THANKYOU to everyone who sent Jack & Marcus post in December – we seemed to receive sack loads! I am trying to write to everyone who I have an address for – please bear with me – I was going to list you all here but I will write to you individually. Jack had a fantastic birthday on 22nd December – we were picked up in a stretch Hummer Limo and taken to his favourite restaurant – Pizza Express where he and 8 friends made their own pizzas then we went to Milton Keynes to see Cinderella that Jack thought was hilarious – he was shouting and laughing out loud – it was lovely to see him. Bobby Davro who played Buttons even said Happy Birthday to him. Health wise things have been pretty good – Jack has had a growth spurt and has lost a bit of weight and looks very well – his hair has grown back again too. He is still suffering from general aches and pains and tiredness and has very dry itchy skin on his face – but apart from a cold he has been well and hospital visits have only been routine. Both boys have loved the snow! We have received some lovely letters from a school in Seoul – Korea – it seems the whole class are planning to come and visit Jack!! Once again, thank you for all your kindness and support. It is impossible to believe that another year is almost over – Jack will be 7 on 22nd December and we pass another milestone as he finishes treatment (if everything goes according to plan) in October 2010. Jack has been up and down health wise – he had his Swine Flu Jabs in November (children under 10 have to have two) and they knocked him for six – his blood counts have not been very good and he is neutropenic (immune system non existent) which means he has been unable to play out with his friends or go to school, which is a real shame. We had a scary time last week when Jack went to bed with a slight cold and awoke at 1am with a severe case of croup and he was struggling to breathe so we had to call an ambulance – the paramedics were fantastic and kept Jack very calm. He was put on steroids and oxygen which sorted out the problem – although now we have an oxygen tank, saturation monitor and steroids at home in case it happens again. The post is coming thick and fast – Elf boxes have arrived and lots of other presents that I have put away to be opened at a later date! We have had cards from Canada and the USA and a wonderful seasonal newsletter from Percy the Poodle. I will try and reply to everyone who has supplied an address. To everyone involved with POST PALS, have a wonderful Christmas and a happy and hopefully healthy New Year. Firstly – huge apologies for not updating Jack’s page since the end of July. Jack continues to respond well to his treatment. He had one spell in hospital at the end of September when he developed a nasty Chest Infection – a week of IV antibiotics cleared it up, but it did mean he had to miss a trip to London to do some Cake Baking with Nigella Lawson. Jack is now two thirds of the way through his treatment – fingers crossed this time next year he will have completed his chemotherapy and things will start to get back to some sort of normality. Jack’s tummy problems are now much better and he is not suffering from daily stomach cramps any more, although he still reacts really badly to his monthly steroids. Thanks to everyone who writes to Jack and Marcus each month – it is really appreciated. Jack managed to get another really nasty dose of shingles in the last week of June which did not respond to anti viral oral medication, so he had to go into Addenbrookes Hospital for 5 days IV treatment. He had to stay in isolation which was not much fun in the heatwave! A week after he was discharged, we went to Cornwall for two weeks and I got what I wished for in my last update – rain, rain and more rain – but we did have quite a lot of sunshine in the middle. We stayed at the same place that we were due to go to in July 2007, but Jack was diagnosed 4 days before we were due to go. It was lovely to finally get there, albeit 2 years late! Jack and Marcus had a fantastic time, body boarding in the surf, go karting, cycling and Quad Biking. Marcus was very lucky and went to see Razorlight at the Eden Project – I had to wait until this year when I was 40 to go to my first concert when I saw Take That last month and he is only 10! We had some lovely post waiting for us when we returned – thank you as always to Jane & Percy the Poodle for the postcards, letters and gifts and to Kym’s cards for the wonderful cards and gift vouchers. Jack saw his consultant at Addenbrookes today and he should get a Swine Flu jab as soon as they are available – Swine Flu is a real concern at the moment and we are keeping Jack away from crowds and being extra careful with hand washing etc. The Consultant gave Jack a really good check over – he has been having pain in the back of his neck from where he had shingles so has some pain relief for that and he has been having quite bad tummy pains and is needing to go to the loo 5 – 6 times a day so he has some new medicine to try to help that too. Sorry I have not updated Jack’s page for a while. Things have been a bit hectic here (as always – so no real excuse!). Jack has managed to have Chicken Pox and Slapped cheek and another very itchy and very angry looking rash which the doctors have decided is an allergic reaction to UV light caused by his chemotheraphy. This means he has to stay out of the sun, always wear Factor 50+ sun cream, long sleeves and a hat – so we are hoping for a rainy summer (sorry everyone else!). Other than that Jack is doing well – he is still off school but is doing well with his teacher who comes to see him at home for an hour everyday. Thank you to everyone who continues to send post to both Marcus and Jack. Hi all – hope you are all keeping well. Thank you to everyone who sent Jack post this month. I know I think he is gorgeous but so must lots of other people judging by the number of Valentine cards he received!! He has received a wonderful cushion and books and stickers – thank you all so much. Jack is off school (again!) as they have another outbreak of Chicken Pox and we can not risk him catching it, so he is back to being home tutored – hopefully he will be able to go back to school in another week if there are no new cases. Heath wise jack is doing well – the monthly steroids still knock him for six and make him really grumpy but other than that he is looking great and keeping well. Thanks for stopping by and catching up. Jack finally managed to go into school for one day this week – hooray! They shut the school because of all the snow – Jack was not bothered in the slightest and has been out playing in the snow. Thank you to everyone who thought of Jack and Marcus in January – they have had post arriving almost everyday from all over the world – they loved the fortune cookies and chopsticks they received for Chinese New Year. Jack was fine having his ‘special sleep’ and as usual took it all in his stride. His chemotherapy dose has had to be increased to 125% because believe it or not his blood counts are too good – I know it sounds crazy and you would have thought that the doctors would be pleased with this, but they want to keep his immune system suppressed and his is being too strong, so they have to try and reduce his counts by increasing his chemo. It really is a case of increasing and decreasing until we get the right balance. What can I say… thank you does not seem enough to all of you who sent Jack birthday cards and presents in December – you are all amazing. And then there was Christmas too! Jack and Marcus received so many cards and presents – they had a sack full of Post Pals presents each to open on Christmas day. Thank you to each and every one of you – especially Jane Beswick & Sarah Marshall and everyone else for your gifts and wonderful cards. Jack has been great – he is now the proud owner of a new bike and an electric guitar and a drum kit! Addenbrookes delayed the Chemo he was due on Christmas day until 30th December so he was not on steroids over Christmas. He has to go into hospital on Thursday 8th January for a ‘special sleep’ and a lumber puncture but I am sure he will take it all in his stride. He is still off school – he has a home tutor for 5 hours a week so he keeps up, but there are too many bugs doing the rounds at school at the moment to risk him going in. Thank you for stopping by and catching up and for all your kindness and support. Have a safe and happy 2009. Well another year nearly over – Christmas is coming up too quickly and we have got Jack’s birthday on 22nd December too! Jack has had a good month, he has been reasonably well in himself – his immune system dropped to zero following his last chemo which left him very tired. He has not been able to attend school because they have a sickness bug doing the rounds and we can not risk Jack catching it as he will not be able to fight it off. That is one of the main worries with a child undergoing chemotherapy. Unlike when a ‘healthy’ child picks something up that they will recover from in a couple of days and a dose of calpol, children having chemotherapy can become very ill very quickly. Anyway, we were very lucky to be invited to a Christmas Party at Harrods in mid December – there were about 200 children there who were poorly or disadvantaged and Mr Al Fared certainly laid on a fantastic party for them – Jack had a fabulous time. We also made an appearance on The Richard & Judy Show’ – I know we are getting so famous – in a tribute to Sir Ian Botham and the money he has raised for Leukaemia Research. Jack has been enjoying receiving his postcards from the Reindeer – Cupid and Dancer so far – they have good hand writing considering they have to write with their hooves! Thanks to all Jack and Marcus’s Post Pals – have a wonderful Christmas and a Happy & Healthy New Year. Another busy month for Jack – thankfully his sore mouth has all cleared up and he hopes to be back at school next week – if there are no new cases of Chicken Pox. We all joined Ian Botham on 13th October for his ‘Great British Walk Against Childhood Leukaemia’ and Jack appeared on the local news on BBC & Anglia. He had a lovely day and Ian Botham’s mother-in-law made Jack a Bacon Roll in the Winnebago – he really does get spoilt! Thank you for all the Halloween cards and gifts – we have had cards from as far away as Japan, USA and Australia. We had a small Halloween party last night – Jack dressed as a Werewolf – he was very much in character as he is on steroids again this week and so his growls and howls were actually for real. I’d like to start by apologising for not replying to everyone who has sent Jack and Marcus post recently. Especially to Jane, who sends them something every week without fail. Thank you Jane for Marcus’ birthday present and for sponsoring the boys for their fun run for Leukaemia Research. Unfortunately Jack has not been very well – he had a very very nasty case of Herpes Simplex (Cold sores) which were all over his lips, in his mouth and down his throat and even on his fingers. He has been really down in the dumps as you can imagine – especially as he has not been able to eat much – which is his favourite pass time! They have cleared up now after 2 weeks of antibiotics and he is back on his chemotherapy. He is off school though as they have got an outbreak of Chicken Pox in his class so he has to stay away! We are going to walk with Sir Ian Botham on Monday in Bury St Edmunds for ‘Beefy’s Walk against Childhood Leukaemia’ so if you live in the East Anglia area tune in to the local news on Monday night and you might see Jack! Jack continues to do well. Although we had a mad dash to hospital at the beginning of August when Jack had an attack of croup and had trouble breathing – he had to be put on oxygen and a nebuliser and stay over night to have a course of steroids to keep his airways open. He has had three attacks so far this year which always happen when he has a cold. Although 24 hours after the attack he was running around as if nothing had happened! Jack is looking forward to going back to school on 3rd September although he is back in Adddenbrookes on the 4th for chemo and more steroids, which means no school for the next week as he will be too grumpy. On 21st September, Jack and Marcus are taking part in the 2008 2k Junior BananaRun which raises money for Leukaemia Research. We set up a fund raising site in September 2007 and so far have raised nearly £10,000 for Leukaemia Research. We are hoping to raise £50K for Leukaemia Research over the next 5 years, as without the tremendous work they do Jack and so many other children would not survive this dreadful illness. Thank you to Jane who sends both Jack and Marcus post every week and to everyone else who continues to think about Jack and Marcus – you are all wonderful! I have hidden away the cards and presents that have been sent to Marcus for his birthday until the actual day on 2nd September. After having quite a quiet time of things hospital wise in the last few months, we have been making up for it in the last three weeks! Jack has been on the dreaded steroids – they seem to make him grumpier every time he has them. He is usually such a happy little boy but these drugs give him a complete personality change and he growls at people! He is also hungry for the whole time he is on them. He never seems to crave healthy food though, just doughnuts and McDonalds, and last week he put on 2lbs in 7 days!! He had to go into Addenbrookes last Thursday for a ‘special sleep’ and had a lumber puncture and chemo in his spine. He only has this every 3 months now instead of weekly but it does not get any easier for us as parents. Thank you to everyone who sends Jack and Marcus post – they get very excited to see who has written to them! Wow – what a busy month and what a lot of post! A massive thank you to everyone who has written to Jack and Marcus and sent them presents. Jack has had a really good month. Although he was not well enough to go on his school trip to the zoo in May, he was able to take part in sports day, which was fantastic. Jack also had a wish granted by The Starlight Foundation and on 28th June we went to Disneyland Paris for 4 days – Jack was so excited! We did not let on to him what was happening until we arrived at the Eurostar Station and his face was a picture! We got back late on Monday 30th June and on Wed 2nd July Starlight granted the second part of his wish which was to go in a Ferrari – he was picked up from School in a Red Ferrari and given loads of Ferrari goodies, including a remote control car, a Ferrari racing suit and lots of other stuff as well – he was a very excited little boy! Then on Friday 4th July we went to the Isle of Wight for a week’s holiday (we only got back today) but unfortunately the weather was pretty awful. The holiday marked an enormous mile stone as it was 1 year ago on 6th July that Jack was diagnosed. Jack has had another busy month – lots of his friends at school have been having birthdays and he has been to quite a few parties. Unfortunately he is not very well today and has had to miss his school trip to Whipsnade Zoo as he had an attack of croup. Jack is very excited that he now has a dog as a Post Pal! Derek the dog wrote him a fabulous letter (thank you Deborah – we will write back very soon) and invited Jack to join his ‘making a mess club’ – which Jack is very keen to go to – it’s just a shame Derek lives in Wales. Hospital visit wise things have been quite quiet – only one visit to Addenbrookes in May and weekly bloods at our local hospital. On 31st May, myself and 14 other friends/family members took part in the Race for Life wearing our ‘Team Jack’ t-shirts – we all managed to get round the course – just! Thank you for the Chemo Duck and massive thanks to every one who has taken the time to write to Jack – please include your address so we can write back. Jack got the all clear from the Cardiac Consultant at Addenbrookes last month which was a huge relief. Jack managed about 5 days at school in April – he had to have one lot of nasty chemo and steroids which made him feel very tired and grumpy. We were invited up to London on 8th May by Leukaemia Research to help launch Sir Ian Botham’s walk for Leukaemia – we met Ian Botham and had a wonderful day – Jack was on Sky news and in the Daily Express and Daily Mirror – he is becoming quite a little celebrity! Thanks to all our postpals – especially Jules who writes every week. Jack has had a really busy month. We only had one visit to Addenbrookes this month for Jack’s Vincristine. Due to Jack not having a Hickman line, he has to have a canula put in for this chemo which can be a nightmare, as his veins have a habit of collapsing and it can sometimes take 3 or 4 attempts to find a good vein. Luckily, Jack’s consultant managed to find a good vein first time. Jack is always very brave – he knows that as long as he sits still he can scream as loudly as he likes which he makes sure he does! Jack’s hair has grown back well – I think I may have to take him for a haircut soon! It’s amazing as in January he did not have a hair on his head. We managed to get away for a few days over the Easter weekend to Norfolk and we woke up on Easter Monday to about 4 inches of snow which the boys loved. Please keep your fingers crossed for Jack on 9th April as we have to see the Paediatric Cardiologist at Addenbrookes for a check up on Jack’s heart following his infection back in November and if everything is ok he will sign us off, which will be one less thing to worry about. Thank you for all the lovely Easter cards. Thank you also to Ellie Boyde for the fab towel and flannels, Linda B for the globe, Kyle & Erin for the Easter Chick and everyone else who sent gifts this month. Jack has been well enough to go to school for four half days this month. He has been on steroids and has been a bit grumpy and very hungry! We held a birthday party for Jack last week as he was too poorly to have a party with his friends back in December. He had a fantastic time! Thank you to all our new Post Pals!